Contributions in any amount are greatly appreciated! These loved ones have been honored in 2018. Dean & Donna Amantea In support of Kenmure Fights Cancer. Julie & Gerry Ashbeck In support of Kenmure Fights Cancer. Bill & Kathy Avery In memory of Earl & Violet Avery. In memory of Bob & Gloria Grauman. Bill & Kathy Avery In support of Kenmure Fights Cancer. Judy Bacon In support of Kenmure Fights Cancer. Bob & Karen Balkman In memory of Kathy Parr Hammond. In support of Jerrie & Tom Russell. In support of Vicki & Guy Leary. In support of Donna & Sandy Hastie. Carrie & Chuck Ball In memory of all those we have lost to this terrible scourge. Bob & Pat Bennett In support of Kenmure Fights Cancer. Peter Benzing In memory of Eva Ruth Benzing. Scott, Rosemary, Phil, & Tanna. Robert Bonner In honor of Annette Bonner. Bonnie, Karen, & Linda In support of Sandy Hastie. Cliff & Betty Brown In support of Kenmure Fights Cancer. In memory of Tony Hussey. In honor and memory of our brothers & sisters. Richard & Susan Bush In support of Kenmure Fights Cancer. Susan Bush In honor of Richard Bush. Tom & Linda Carpenter In memory of Raymond Tanner (father of Linda Carpenter). Tom & Linda Carpenter In honor of Sandy Hastie. and of those now bravely fighting the fight. John & Donna Crawford In support of Sandy Hastie. In honor of Mike Beckerman. In honor of Richard Bush. In honor of Barbara & Joe Carter. In honor of Marcia Caserio. In honor of Nancy & John Eskew. In honor of Bob Spataro. In honor of Joan Uhrich. In honor of Paige Willms. volunteers in Kenmure-KPOA, KNN, & KFC. Debbie & Peter Dunderdale In memory of Rita Dunderdale. In memory of Jack Willobee. In support of Louise Lay. John Ely In memory of Betty A. Ely. Ted & Carolyn Etherington In memory of Tom Hester. Mike & Georgie Farmer In memory of Tanna Johnson. Gary & Diane Gallagher In memory of Roger Lange. Viviane Garner In support of Kenmure Fights Cancer. Chip & DeeDee Gould In support of Kenmure Fights Cancer. Merrily Graber In support of Kenmure Fights Cancer. Betsy & Jim Gunn In honor of Susan Bush. In memory of Tony, Cindy, & John. 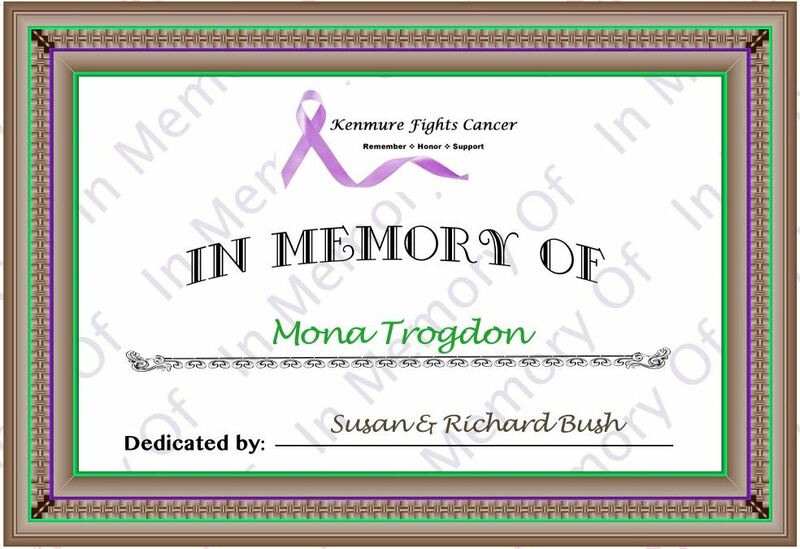 for their support of Sandy & Donna and many others. for their support of Donna & Sandy. Don & Elaine Hessong In memory of Family & Friends. Michael & Melodie Hodges In support of Kenmure Fights Cancer. Loving memories of husband & son. Alan & Pam Jastczemski In memory of Mark Jastczemski. Don & Lynn Johnson In honor of Sandy Hastie. Karen Johnson In memory of Marcia Davidson. Sue Fleming Kauffman In honor of Carolyn Etherington, friend. In memory of Martha & Sam Fleming, parents. Sue & Don Kauffman In honor of Sandy Hastie, friend. In memory of Carol Medinger, dear friend. In memory of Rick & Barb Rusch, dear friends. Claude Kellogg In support of Kenmure Fights Cancer. Eric & Ann Koopman In support of Kenmure Fights Cancer. Dan & Edie Lang In memory of Joseph Bronitsky. John & Margaret Langston In support of Kenmure Fights Cancer. Carols Lyons In honor of J. Austin Lyons. Bonnie Manos In support of Kenmure Fights Cancer. Norman & Rosemary McCann In honor of Norman & Rosemary. McCann Family In honor of Norm McCann. Sydney & Patrick McGuire In honor of Nancy Eskew. my wonderful wife & best friend. and Susan Allen In support of Sandy Hastie. In support of Claude Kellogg. In honor of Melinda McCormick. In honor of Martin Greedy. In memory of David Allen. In memory of Gene Armstrong. In memory of Rachelle Melvin. Tom & Jackie Murrill In support of Kenmure Fights Cancer. Chip & Karen Pryde In support of all who are fighting cancer & the families and friends who support them. Chip & Karen Pryde In support of Kenmure Fights Cancer. Florence Pucilowski & Frances DeFrancisco. Our mothers, who lost the battle to this disease. fighting his battle with lung cancer. Galen Reuther In memory of Carol Medinger. Bill & Leslie Robins In memory of Carol & Richard Keighron. In memory of Page Robins. Dan Dantin In memory of Frank Santos. Dan & Cheryl Schindler In support of Kenmure Fights Cancer. Arlene & Tim Sheeran In support of Kenmure Fights Cancer. Bill & Karen Skelton In support of Kenmure Fights Cancer. Robert Stone In support of Kenmure Fights Cancer. Kevin & Dale Tait In support of Kenmure Fights Cancer. Jerry & Jane Tanner In memory of Julius O. Tanner. Kathrine Tims In support of Kenmure Fights Cancer. George & M.G. Tyda In memory of Gail & Mark Levine. In memory of Beverly & Don Pacquer. Bryan & Cynthia Vick In memory of Roxy, Murphy, Al, & Olga. Roy & Wanda Williams In memory of Ted Seagroves. Bob Wilson In memory of Pat Wilson. Jeff & Debbie Wilson In memory of our son in law, Erik Russell. Jeff & Debbie Wilson In support of Kenmure Fights Cancer. Mary Lou & Michael Yuskanich In support of Kenmure Fights Cancer.